Combine the best museums of San Francisco with the ultimate Hop-On Hop-Off pass! It is the best way to see all major sites of San Francisco and to explore some of the world’s best modern art at the SFMOMA as well as the natural landscape at the De Young Museum. 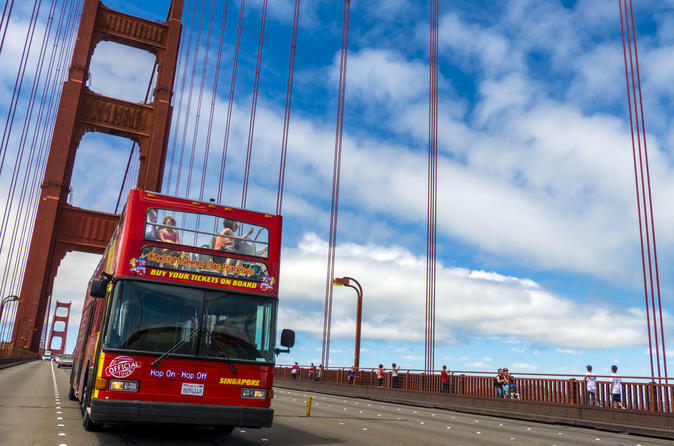 The 1-Day Hop-On Hop-Off Pass gives you the opportunity to explore Downtown San Francisco, the Golden Gate Bridge, Golden Gate Park and charming Sausalito with live narration by entertaining tour guides or audio guide in various languages with unlimited hop-on hop-off use for 24 hours. In addition to the hop-on hop-off pass, your tour includes admission to two of the best museums in San Francisco. The San Francisco Museum of Modern Art (SFMOMA) is home to an internationally recognized collection of modern and contemporary art. It reopened in May 2016 following a major 3-year expansion project, which provided almost six times as much public space as the previous build, making the museum one of the largest in the United States overall and one the largest in the world for modern and contemporary art. The de Young Museum in Golden Gate Park was founded in 1895 and has been an important part of the cultural fabric of the city for more than 100 years. In 2005, the de Young Museum reopened in a state-of-the-art facility that integrates art, architecture, and the natural landscape in one multifaceted destination that inspires audiences from around the world.